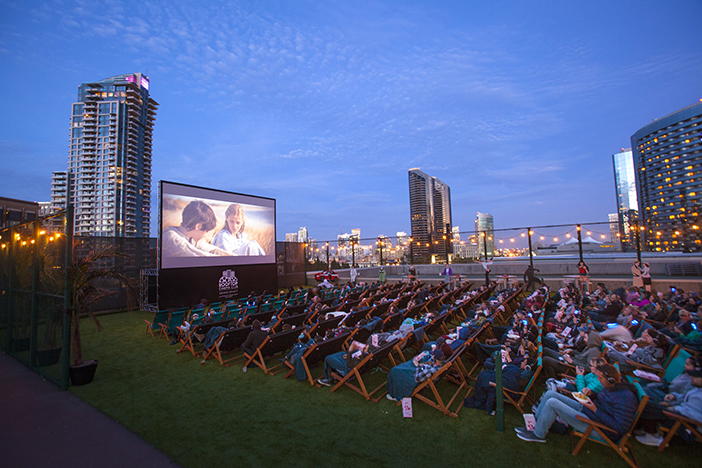 Catch the sunset alongside a film screening at the Rooftop Cinema Club. Discover a new type of movie-going experience under the stars at San Diego’s new Rooftop Cinema Club located atop downtown’s Manchester Grand Hyatt. Enjoy a wide range of films, from timeless classics to recent releases, while you sit back and relax. Grab a cocktail or craft beer along with your popcorn at the concession stand before the movie starts or stop by early for one of the Manchester Grand Hyatt’s on-site dining options like Top of the Hyatt lounge located on the 40th floor or Sally’s Fish House & Bar. San Diego’s Rooftop Cinema Club is open to adults 18+. Tickets start at $17 per person for a single lounge seat. For $20, guests will receive a single lounge seat along with bottomless popcorn, and for $24 per person, a couple can enjoy their movie in the comfort of a double love seat with bottomless popcorn for both. Doors open at 6:30 p.m. and movies begin around sunset.